Story: Peter Vimmelskaft is a little Danish man who enjoys life with his friend the penguin Ping. Background notes: Storm P. was one of the people who introduced the comic medium in Denmark. 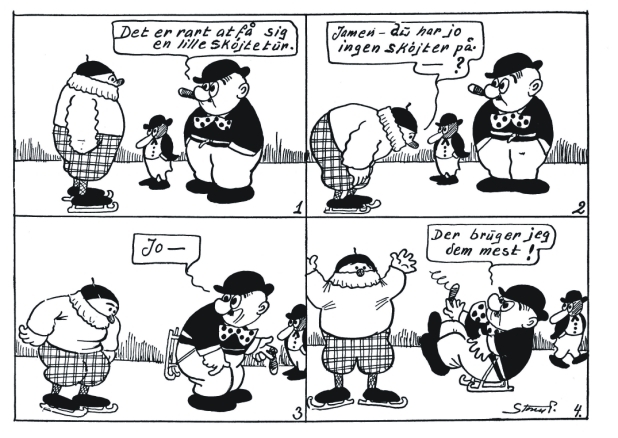 He started with the strip "Kan De Det?" which evolved into "De tre små mænd og Nummermanden" shortly after, both in 1913. 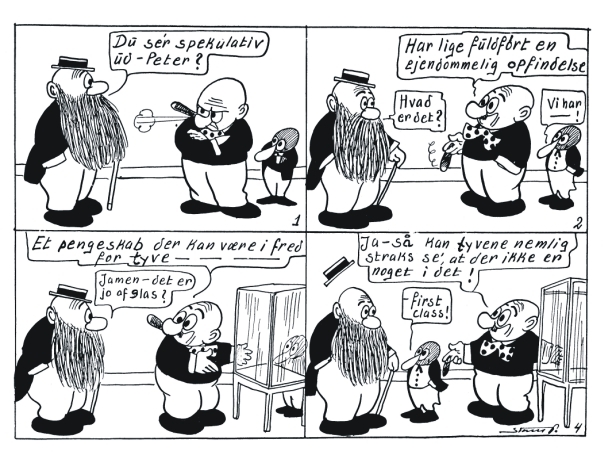 In 1922 he started the series "Peter Vimmelskaft" in the Danish newspaper B.T. on March 8, and with the introduction of the penguin Ping on November 7 the same year the series became "Peter og Ping". In the beginning, Peter was a tall skinny man. It wasn't until Ping was introduced that he became short and plumb. Like Soglow's "Little King", Peter og Ping was more amusing than funny. The stories were not supposed to make you laugh out loud; only smile. Storm P. called his jokes fluer (flies) and they became his trademark along with his characteristic artistic style. 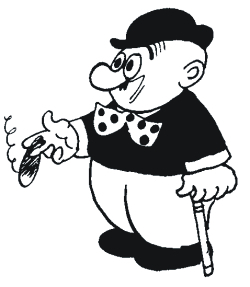 Peter og Ping is credited as the first Danish comic to gain international fame. The series was not continued after Storm P.'s death in 1949, but remained in print as comic books long after. The series did not cross over to other medias contrary to "De tre små mænd og Nummermanden", but Ping-klubben (the Ping Club), a club for children started by B.T. in 1927, was named after Ping. The club still exists today. The Little King: Similar type of humor.